Today we announce that the Opera browser is now available as a snap in the Snap Store on Linux systems. 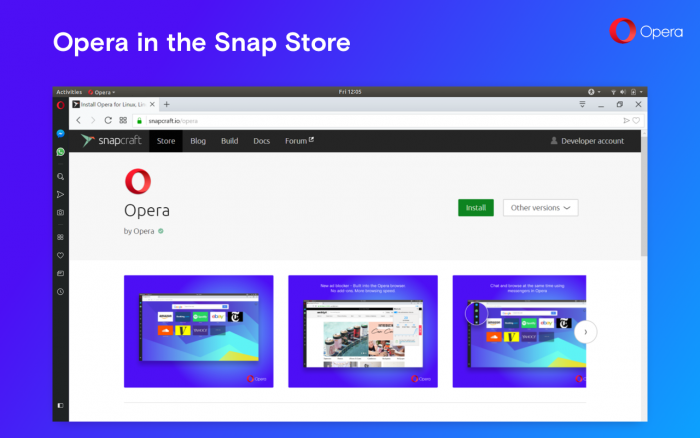 Opera is the latest notable addition to the Snap Store, an online shop which provides Linux users easy-to-install and always up-to-date applications direct from the software vendors. Snaps are containerised software packages, designed to work securely within any Linux environment across desktop, the cloud and IoT devices. 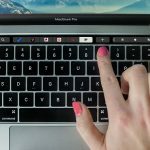 Thousands of Snaps have been launched since 2016, with their appeal coming from the automatic updates and roll-back features, plus security benefits, allowing greater flexibility for developers on the one hand, and a more seamless experience for users on the other. The addition of Opera to the Snap Store enables users of all major Linux distributions to benefit from the auto-updating and security features that snaps provide. The Opera snap is supported on Debian, Fedora, Linux Mint, Manjaro, Elementary, OpenSUSE, Ubuntu and more distributions. 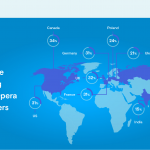 “We are happy to say that the installation of our browser on Linux just got easier than ever before,” said Krystian Kolondra, Opera EVP Browsers. All three streams of the Opera browser (stable, beta and developer) are planned to be available in the Snap Store.